Justice Department Inspector General Michael Horowitz and FBI Director Christopher Wray wait to testify before the Senate Judiciary Committee on Monday. Justice Department Inspector General Michael Horowitz and FBI Director Christopher Wray headed to Capitol Hill Monday for a grilling from senators — that quickly turned partisan — about the inspector general's scathing report on the FBI's mishandling of the Hillary Clinton email investigation in 2016. The nearly 600-page report, which was more than a year in the making before it was released last week, provided ample political ammunition to lawmakers on both sides of the aisle during Monday's hearing before the Senate Judiciary Committee. You can read the report's executive summary here. Republicans said the report proved that Hillary Clinton got off easy in the FBI's investigation into her use of a private email server while secretary of state, because of rampant political bias within the Justice Department. The IG report uncovered and dug in on politically charged messages sent by FBI Special Agent Peter Strzok and then-FBI lawyer Lisa Page, and others, that indicated a clear distaste for then-candidate Donald Trump. "This report confirmed what the American people have known for a long time," said Iowa Sen. Chuck Grassley, the Judiciary Committee's Republican chairman. "Hillary Clinton got the kid-glove treatment. The contrast to the Russia probe is very stark." Democrats, on the other hand, pointed to Horowitz's findings that no decisions made by the Justice Department while investigating Clinton's private email server "were affected by bias or other improper considerations," despite Trump's consistent accusations of a "deep state" conspiracy against him and in favor of Clinton. "While the report was highly critical of [Former FBI Director James] Comey, it did not find that he was biased against President Trump or in favor of Secretary Clinton, as some have alleged," said Sen. Dianne Feinstein, the committee's ranking Democrat. After the report was released on Thursday, Trump claimed that it "totally exonerates" him in the Justice Department's Russia investigation into possible coordination between his campaign and Moscow during the 2016 election. The Justice Department's inspector general, however, pushed back on that notion on Monday, saying the report was only focused on the FBI's investigation into Clinton's private email server in 2016 and not on special counsel Robert Mueller's ongoing probe into Russian election interference. "We did not look into collusion questions," said Horowitz, in response to questioning from Sen. Patrick Leahy, D-Vt.
"As I said to you last month, and as I said to you before, I do not believe special counsel Mueller is on a witch hunt," said Wray during the same line of questioning. In the report, the inspector general did conclude that Comey made a series of mistakes leading up to the election, including a "serious error of judgement" in announcing the reopening of the Clinton investigation less than two weeks before Election Day in 2016. As Trump and his allies work to discredit Comey and others who either are or were previously involved in investigating his campaign, the report has offered a potential way to undermine them. Democrats have had to toe the line of not defending the actions of out-of-line government employees, while conveying confidence in the ability of the Justice Department and the FBI to carry out their Russia probe fairly. Democrats have also taken issue with Comey's decision to speak publicly about the Clinton email investigation so close to the 2016 election. Clinton and her allies have pointed to Comey's actions and decision in the final weeks of the 2016 presidential race as a reason she lost. "If the FBI was trying to throw the election to Hillary Clinton, it couldn't have done a worse job," Leahy said. Horowitz confirmed Monday that his office is also currently looking into Comey's disclosure of memos he wrote about interactions he had with Trump. The inspector general is also separately looking at the Justice Department's actions in the early days of the Russia investigation and whether the FBI abused its surveillance authorities to target a former Trump campaign foreign policy adviser. "If we can look at only one or two investigations, and find this much bias and unprofessionalism, I can only imagine what else is out there," said Sen. Orrin Hatch, R-Utah. 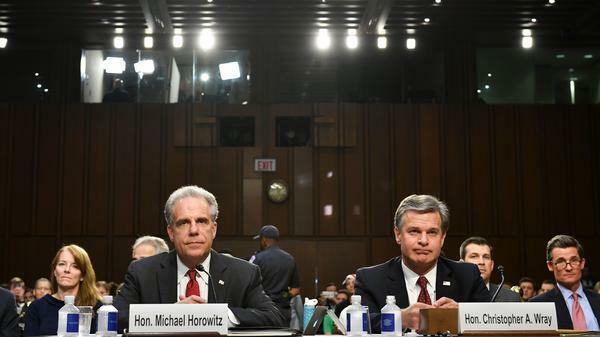 Wray, who eventually took over the FBI after Comey was fired last summer, said he was taking the report's findings in stride and putting a plan in place to make sure the agency's 37,000 employees don't repeat mistakes spotlighted by Horowitz. He said employees whose misconduct was detailed in the report have been referred to the Office of Professional Responsibility, which is in charge of investigating such allegations. He also said there would be new training for FBI personnel about the appearance of political bias, as well as how they should interact with the news media. Republican lawmakers seized on a line in the IG report that noted "instances where FBI employees received tickets to sporting events from journalists, went on golfing outings with media representatives, were treated to drinks and meals after work by reporters." "We're trying to make sure we're not just doing the right thing, but that we're doing it in the right way," said Wray. "And pursuing the facts independently and objectively no matter who likes it." Before Monday's hearing, both Wray and Horowitz had last testified before the committee in July 2017. Wray answered questions from senators when he was nominated by Trump to lead the FBI, and Horowitz spoke about enforcement of the Foreign Agents Registration Act. Horowitz is also scheduled to testify before a joint hearing of the House Oversight Committee and the House Judiciary Committee on Tuesday.